Cambridge Consultants has developed DelivAir, a drone that delivers packages and aid directly into your hand using GPS and optical tracking technology. A new system allows a drone to overcome the need for a landing zone and uses the customer’s smartphone to locate them and then optical tracking to deliver the package directly into their hand. Amazon has set itself the goal of delivering some products purchased on its website in thirty minutes or less using drones. The company, which launched its Prime Air program in 2013, is considering beehive-like drone towers that would serve as future fulfillment centers. 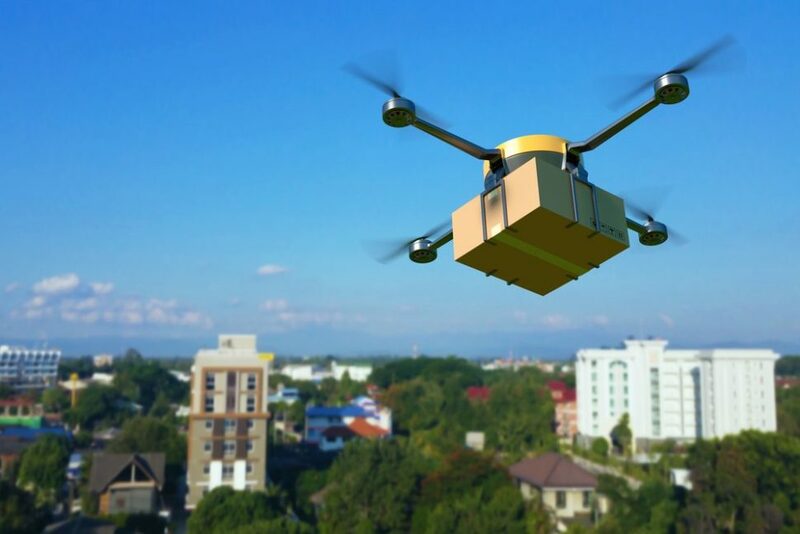 To serve consumers faster and better, Alphabet, DHL, UPS, FedEx, Wal-Mart, Domino’s and other e-commerce retailers, logistics and distribution companies are preparing and pushing for a (near) future where e-commerce fulfillment drones would be roaming the sky. Regulations, logistical challenges, and public acceptance are the three main obstacles that prevent the drone delivery market from going full swing. Drone Delivery: Pie in the Sky? The recent FAA regulations that lifted the embargo on the commercial use of UAVs, have opened the way, over the next 10 years, for the emergence of a $82 billion USD market in the U.S. and the creation of more than 100,000 new jobs. In its report entitled The Economic Impact of Unmanned Aircraft Systems Integration in the United States, AUVSI (the Association for Unmanned Vehicle Systems International) believes that over $13 billion USD and 70,000 jobs will be generated in the first three years alone. The FAA’s “line-of-sight rule” is weighing drones down, but regulations are only one hurdle to the development of drone delivery industry. The US Postal Service surveyed 1,200 consumers and found that only 32% consider drone delivery to be safe, while the general public seems to be still hesitant to accept the commercial use of drones. There are also some technical constraints still facing delivery UAVs. Drones are not able to deliver a package directly to the customer, requiring predefined delivery zones free from obstacles, like a backyard. But in some cases, customers who live in dense cities or high areas might not have a yard for drones to land safely. Rooftops could be dangerous both for the drone when landing, and for the customer when retrieving the package. If the FAA has the rules part covered and will lift the regulatory barrier little by little, and mass adoption is a question of time or “getting used to it”, leave the problem of needing drone landing areas to Cambridge Consultants to solve. DelivAir Delivers Your Package Right Into Your Hand, Wherever you are. Cambridge Consultants, a product design and technology consulting company, has developed a system that addresses a major logistical challenge for drones and makes delivery more convenient. Called, DelivAir, the system uses a drone, a GPS system, and a camera to deliver packages directly into the hand of customers, regardless of their location. DelivAir doesn’t need a physical address to locate the customer, it locates the user’s smartphone and, thanks to the GPS, gets constant updates of their location during the flight. To ensure the package is delivered to the right recipient, DelivAir uses precision optical tracking and 3D imaging system to authenticate the individual who, by simply pointing their smartphone LED towards the sky, would show the drone the exact delivery point. The drone hovers at a safe height above the delivery point while lowering the package with a stabilizing winch into the hand of the recipient. As soon as they detach the package, the drone flies back to the fulfillment center for another delivery. Based on a patent-pending two-stage routing process, DelivAir is not even at the prototype stage and its commercialization will, therefore, take some time. Cambridge Consultants says the future of high-precision drone delivery is enabled by mobile phones–an ideal Industry 4.0 methodology. When their time does come, however, the company thinks its system will be ideal for emergency deliveries (relief packages for disaster areas, medical supplies, and other critical items needed urgently). What’s an ideal scenario for a high-precision drone delivery in your life?